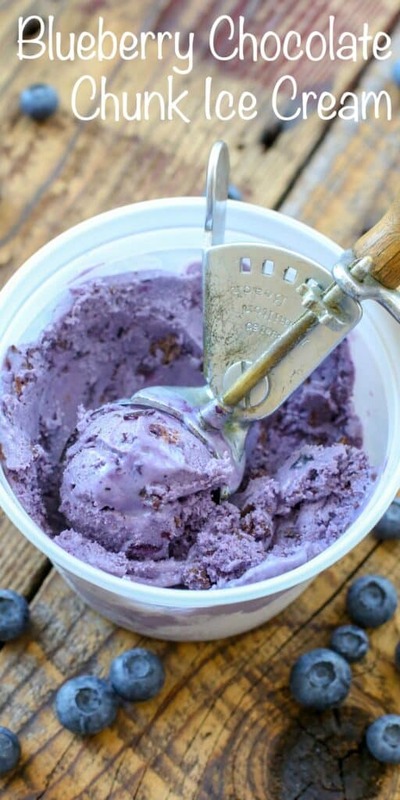 This Creamy Blueberry Ice Cream with Dark Chocolate Chunks has been my weakness for the past couple years. I haven’t been keeping it a secret from you, but up until now I haven’t had the recipe. 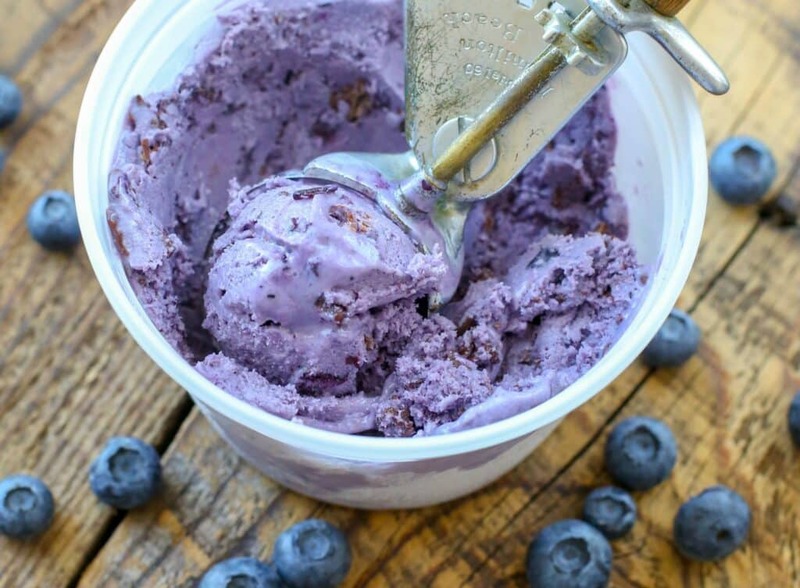 When I tell you that this Blueberry Ice Cream is absolutely divine, you can take that to the bank. I first tried this ice cream at Rusconi’s American Kitchen. Rusconi’s has been my favorite date night restaurant, girls night restaurant, happy hour, and special occasion destination for a while now. The selection of ice cream on their dessert menu varies according to what the chef has made that day and I always cross my fingers that this flavor will be available when we’re there. The first time we heard about this ice cream, the couple at the table next to us was asking the waiter if there was any Blueberry Ice Cream available. They ordered a pint to take home and then leaned over to us and told us about it. They grinned at us as they apologized for taking the last of it home with them and told us that we simply had to try it the next time we were at Rusconi’s. 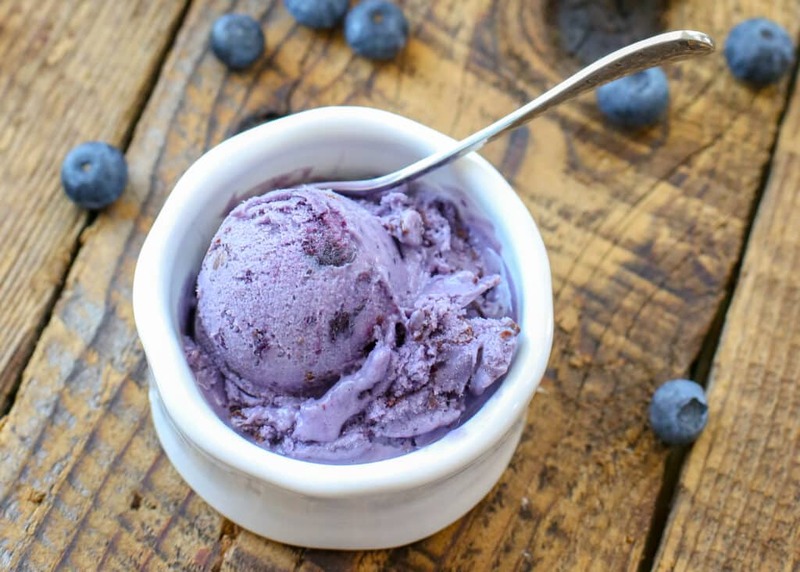 You can bet that this ice cream lover ordered a scoop of the Blueberry Ice Cream to try the next time we ate there. I may have sighed with happiness at the first bite, and the second bite, and every bite down to the very last bite. From then on, this Blueberry Chocolate Ice Cream has been my favorite ending to every meal at Rusconi’s and I am disappointed when it is not available. 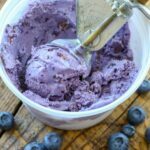 I’ve made several variations of blueberry ice cream including this Blueberries and Cream Ice Cream years ago. 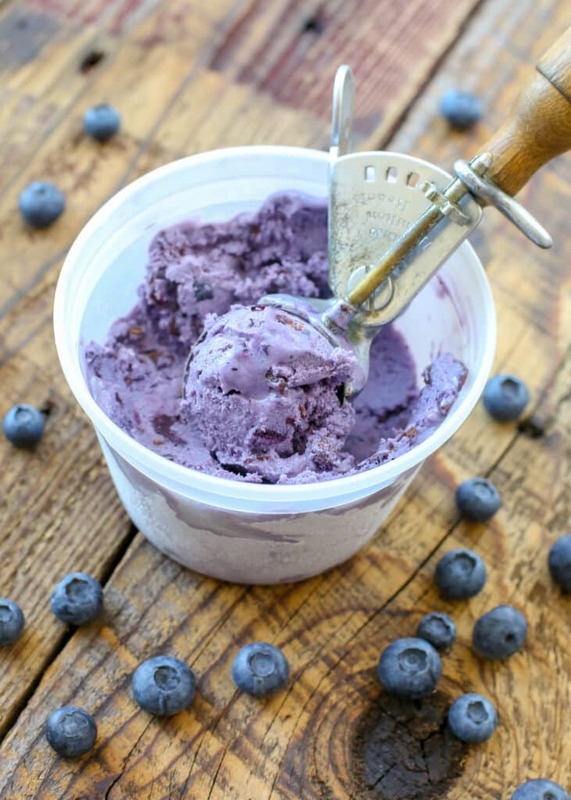 It’s absolutely delicious, but it just doesn’t compare with the depth of flavor in the Rusconi’s Blueberry Ice Cream. A couple months ago, I finally asked the chef if they might be willing to share the recipe. To say I’ve been a regular at the restaurant doesn’t even cover how loyal I am at this point. Lucky for me, the chef was willing to write out his recipe and share it. 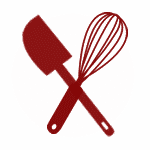 I’ve also changed it slightly to make it a teeny bit more approachable for the home cook. I typically make a Philadelphia-style ice cream without eggs. But this version is worth the extra moments in the kitchen. That said, I very rarely temper eggs for my ice cream recipes and this variation is foolproof as long as you don’t walk away from the stove. If the ice cream base does happen to curdle a tiny bit, you can strain it through a fine sieve or colander to remove any bits of cooked egg. There are three simple steps to this recipe. Nothing complicated, but you do need a little bit of time and prep in advance. You can make this sauce with fresh or with frozen blueberries, so you can enjoy this recipe all year long. Combine the blueberries and 2 tablespoons sugar in a medium-size saucepan over medium heat. Shake or stir the pan as the berries begin to cook. Reduce the heat to medium-low and let the berries cook, bursting as they simmer until the mixture is thick and has reduced to about 1 cup’s worth of berry sauce. In a cold medium-size saucepan, whisk the eggs and sugar until smooth. Add the milk and vanilla and whisk until smooth once more. Turn on the heat under the saucepan and set to medium, stirring frequently. As soon as it begins to simmer, continue stirring constantly until the mixture thickens and coats the back of the spoon. This should take about ten minutes. Take care not to overcook. Remove from the heat as soon as the mixture coats the spoon. Add 1/2 cup of the blueberry sauce and stir to combine. Let cool to room temperature before pouring until the ice cream maker. Churn according to the manufacturer’s instructions. While the ice cream is churning, combine the chocolate chips and coconut oil in a small glass bowl. Microwave for 90-120 seconds until softened. Stir to melt. Scoop the finished ice cream into an airtight container, drizzling chocolate over each scoop as it is added to the container. Swirl lightly with a knife or the end of a spoon and drizzle any remaining chocolate over the top of the ice cream. Cover with lid and place in the freezer until ready to serve. Combine the blueberries and 2 tablespoons sugar in a medium-size saucepan over medium heat. Shake or stir the pan as the berries begin to cook. Reduce the heat to medium-low and let the berries cook, bursting as they simmer until the mixture is thick and has reduced to about 1 cup's worth of berry sauce. In a cold medium-size saucepan, whisk the egg yolks and sugar until smooth. Add the milk and vanilla and whisk until smooth once more. Add 1/2 cup of the blueberry sauce and stir to combine. Let cool to room temperature before pouring until the ice cream maker. Churn according to the manufacturer's instructions. Cover with lid and place in the freezer until ready to serve. Enjoy! Holy Cow! Gonna go get me some blueberries and chocolate. Ha, you ARE disappointed when they don't have it! Problem solved, we can go out for truffle mac and cheese and then come home for this! You know me well. I like the way you think! Gonna go get me some blueberries and chocolate.